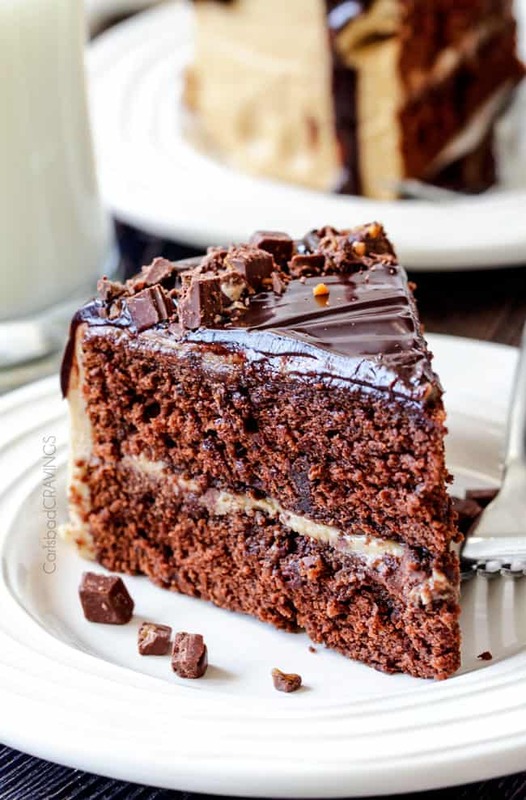 Crazy moist Salted Caramel Milk Chocolate Cake, busting with milk chocolate covered toffee bits, coated in Caramel Icing and smothered in silky chocolate ganache. THE only chocolate cake recipe you ever need! Thank you Green and Black’s Organic Chocolate for sponsoring this recipe. All opinions are my own. I can’t resist its siren calls. Whether it’s dark, white, semi-sweet, or milk chocolate – I answer every time. I try and be polite that way. Whether in cake, brownies, fudge sauce, candy bars, cookies, ice cream, mousse etc., chocolate makes the blissful world of desserts go-round. 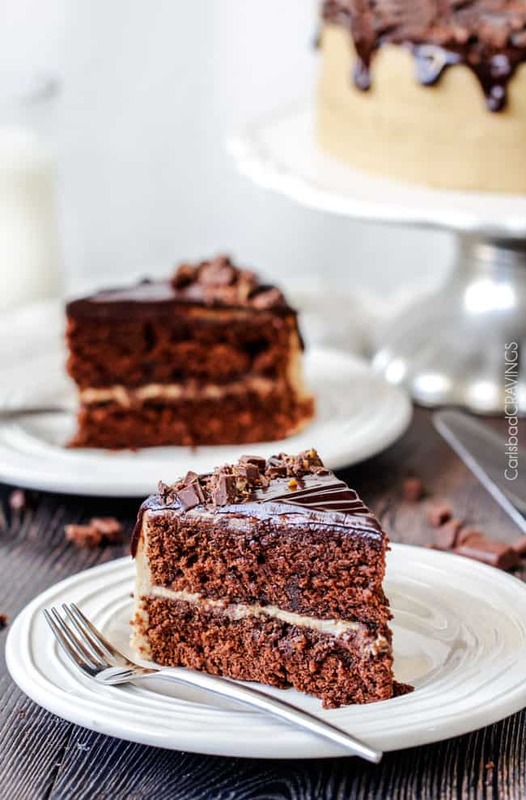 My favorite rich dose of chocolate is chocolate cake – this Salted Caramel Milk Chocolate Cake to be precise because it is mouthfuls of chocolate and caramel. Divine. 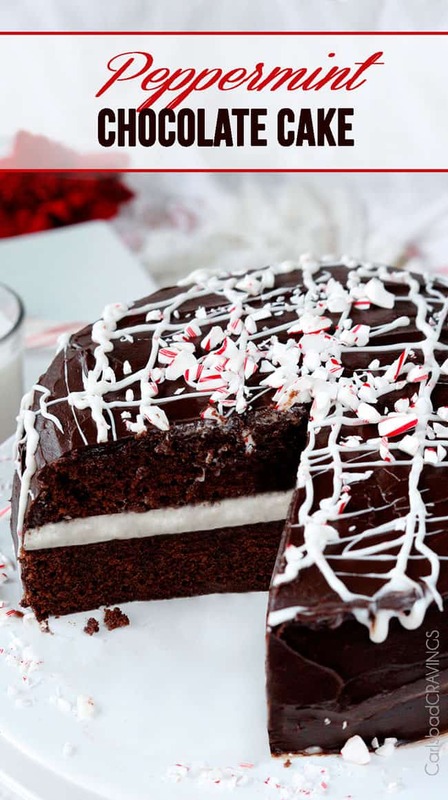 I adapted my favorite chocolate cake recipe used in my Peppermint Chocolate Cake and infused it with GREEN & BLACK’S ORGANIC Toffee Milk Chocolate. 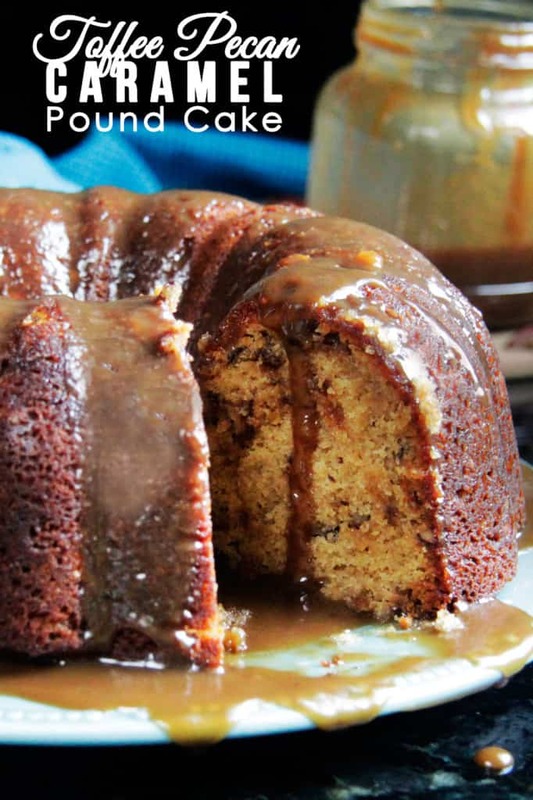 So yes, this cake boasts, chocolate, caramel and toffee! It’s every bit as delicious as you are imagining right now – and then some. 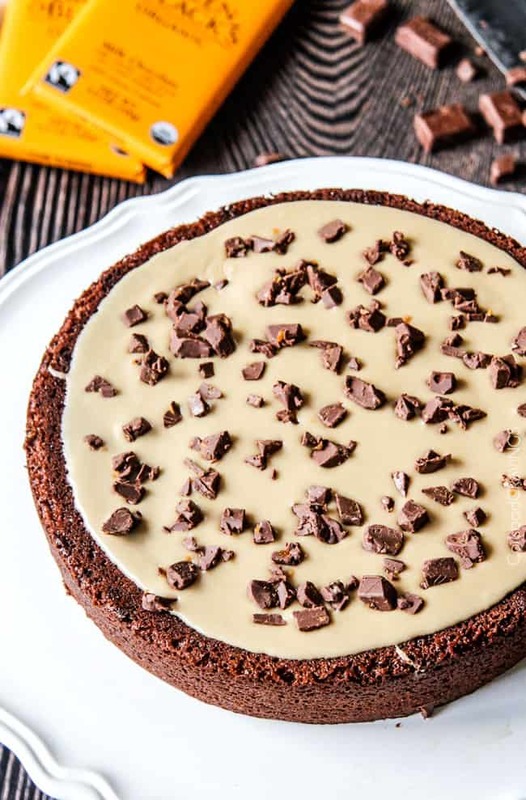 The delectable, buttery, smooth and crunchy organic milk toffee bars get melted as part of the cake batter, chopped pieces get stirred into the batter, and lastly, the milk chocolate toffee adorns each tier of the double rich cake. 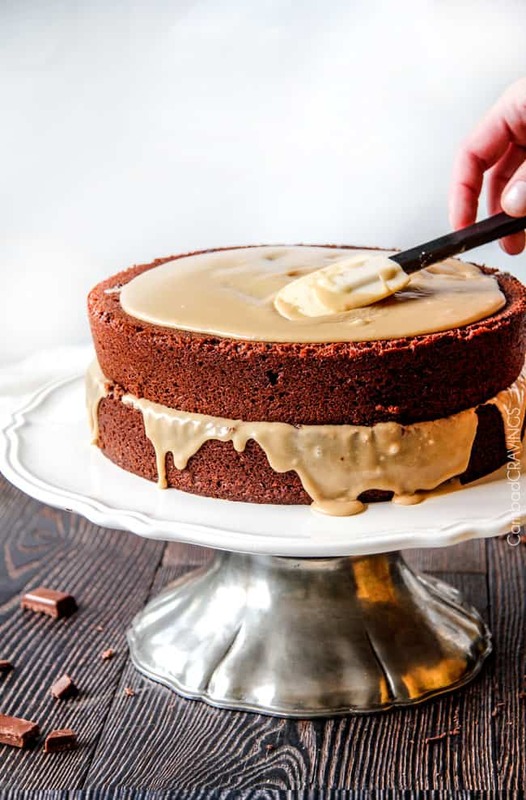 The crazy, moist, uber-chocolaty cake gets a double layer of silky, Salted Caramel Icing – which is barely enough for how badly you are gong to want to eat it with a spoon. The bit of saltiness balances out the milk chocolate sweetness and keeps you coming back for more. For my cake, I frosted it with a thin layer of icing, then let it set then frosted it again with a second layer for a completely enveloped, more opaque look, but you can just frost once and be done – completely up to you! Both taste AH-mazing. 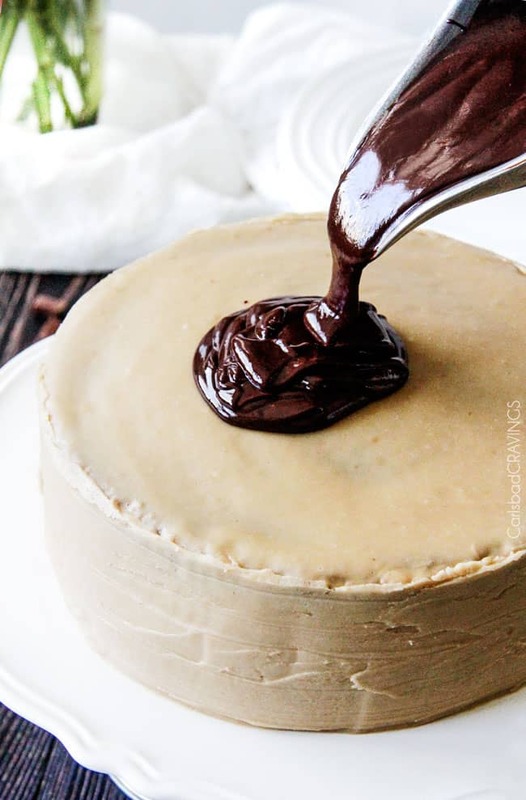 The crowning glory of this Salted Caramel Milk Chocolate Cake is the silky chocolate ganache: soooo smooth, soft and the perfect compliment to the texture of the crystalized sugary caramel icing. After I had finished photographing this cake, I called a few friends to see if they were home so I could drop some off – no one was home. So the cake sat on our counter all day, and all night. By the second day, half the cake was gone. True story. It’s that good. That irresistible. That chocolaty. Thank you GREEN & BLACK’S ORGANIC Chocolate. 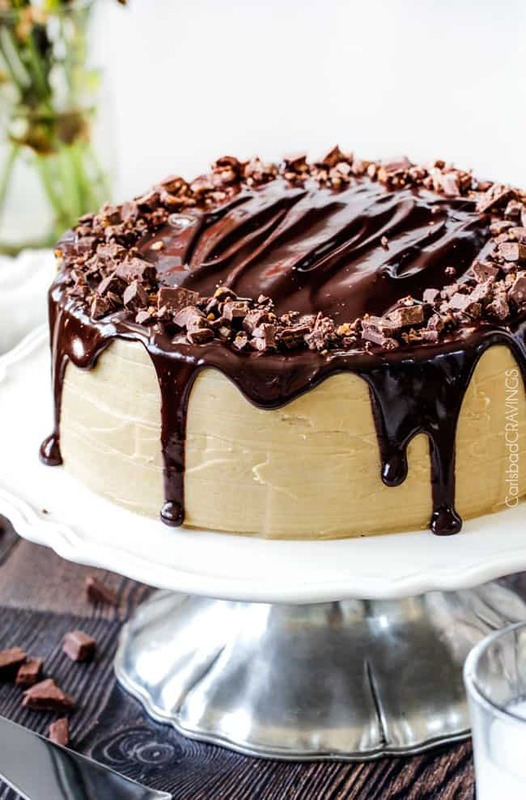 Crazy moist Salted Caramel Milk Chocolate Cake, busting with milk chocolate toffee bits, coated in Caramel Icing and smothered in silky chocolate ganache. 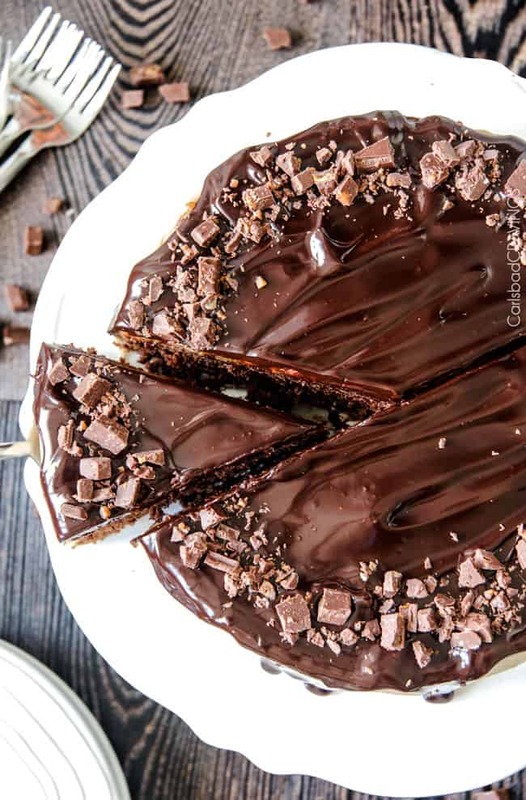 THE only chocolate cake recipe you ever need! Chocolate Cake: Add 2 chopped Toffee Bars to a microwave safe bowl and melt in the microwave at MEDIUM (50% power), stirring at 30-second intervals (about 1 1/2 minutes total time). Stir until smooth. Set aside. Beat butter and brown sugar at medium speed with an electric mixer for 4 minutes. Add eggs, one at a time, beating just until yellow disappears after each addition. Add melted chocolate and beat just until blended. Sift together flour, baking soda, salt, and cocoa powder in a separate bowl. Gradually beat flour mixture into chocolate mixture at medium-low speed, alternately with sour cream, beginning and ending with flour mixture. Beat at low speed just until blended after each addition. Gradually add 1 cup hot water in a slow, steady stream, beating at low speed just until blended. Stir in vanilla and one chopped Toffee Bar. Grease two 10-inch round cake pans with nonstick cooking spray containing flour or butter and flour the pans. Divide batter evenly between the pans and bake at 350° F for 25-35 minutes or until a wooden pick inserted in center of cake comes out clean (mine took exactly 33 minutes). Cool in pans on a wire rack 10 minutes; remove from pans, and let cool completely on wire rack before icing. 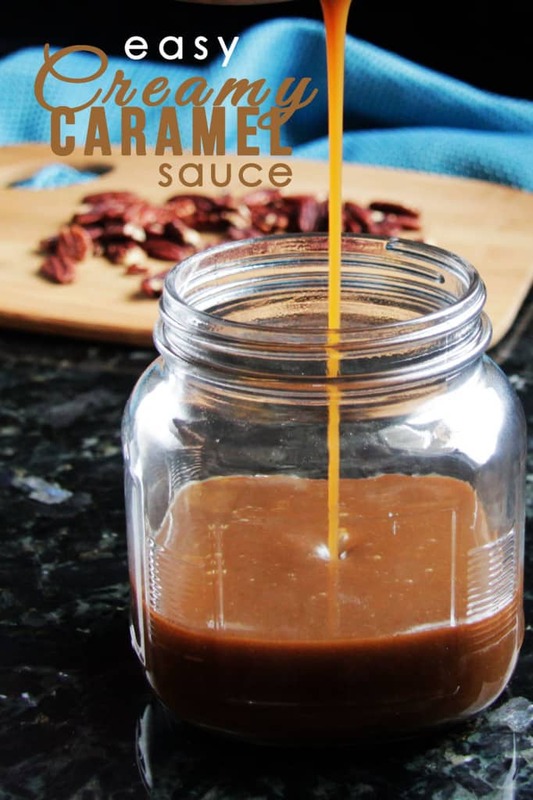 Caramel Icing: Add butter and brown sugar to a small saucepan and stir over medium heat until butter is melted. Transfer to a mixing bowl and add 3 tablespoons heavy cream, powdered sugar, vanilla and salt. Beat with a handheld electric mixer at medium high speed for 4 minutes. Let cool to room temperature, approximately 10-15 minutes. Icing will thicken upon standing. 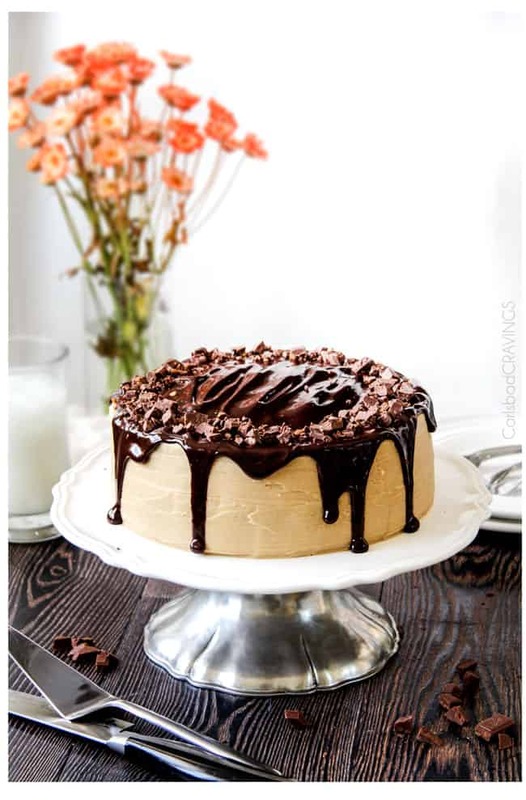 If icing has become too thick after cooling, beat in additional heavy cream, one tablespoon at a time to reach desired consistency..
After cakes are cool and icing has cooled for 15 minutes, spread approximately 1/2 cup caramel icing on top of one cake round and sprinkle with 1/4 of a chopped Toffee Bar. Top caramel icing/chopped candy bar with the other cake and continue to frost. I like to cover the cake in a thin layer of icing then let it set, then finish with remaining icing for a more opaque look. Chocolate Ganache: Add heavy cream, butter and corn syrup to a large microwave safe bowl and heat for two minutes, stir to combine. Heat at 30 second intervals if butter is not completely melted at this point. Add chopped chocolate and stir until chocolate is melted. Let cool for 15 minutes. Spread the ganache just to the edges of the top of the cake. Push the chocolate over the edge of the cake in a few spots to create some “drips” if desired. Garnish cake with remaining chopped Milk Chocolate (3/4 of a bar). 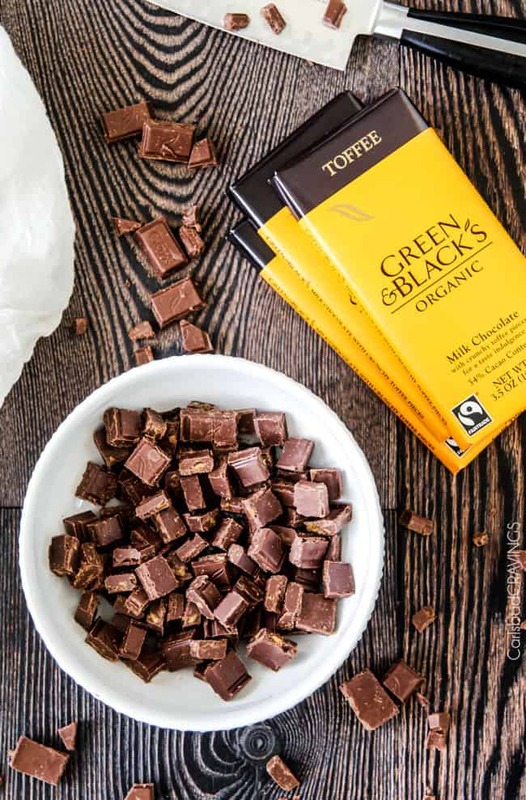 *Chop and keep Toffee Bars separate in order to measure. You will melt 2, stir in one to the cake batter, use 1/4 in between cake layers and the rest to garnish the cake. Detailed directions in recipe. **Total time does not include cake, caramel and ganache cooling. my preference has always been milk chocolate!! I love White Chocolate and Milk Chocolate. I love all manner of chocolate. Sometimes the spiced chocolates are not as palatable but I will always give them a try, too. Yes, that would work just fine, enjoy! Is this 350° Fahrenheit? So it will be 180° Celsius? Yes 180 Celsius should do it! Enjoy! I made this cake once and it was outstanding! I hope to make it again for my sister’s birthday this week. I am wondering one thing – the salted carmel icing came out a bit grainy from the sugar. 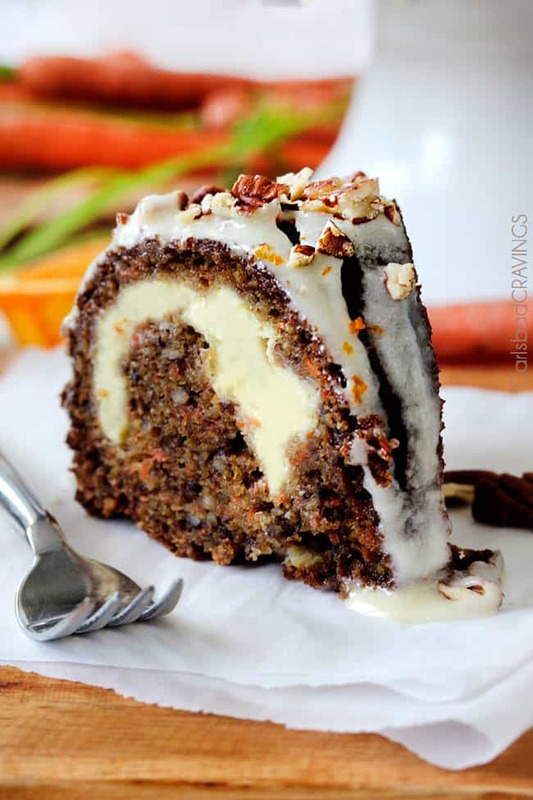 Is this intended to be this way or should the icing be smooth? If it’s meant to be smooth, any suggestions as to how to fix that! Hi Alyssa, I am so sorry for the delay as we moved this week and things have been a lot crazy so I am so sorry if this response is too late! The caramel icing is a bit grainy but i think if you simmer it for a minute or so then it should be less grainy. Hope that helps and happy birthday to your sister! Can I have this recipe in grams please? 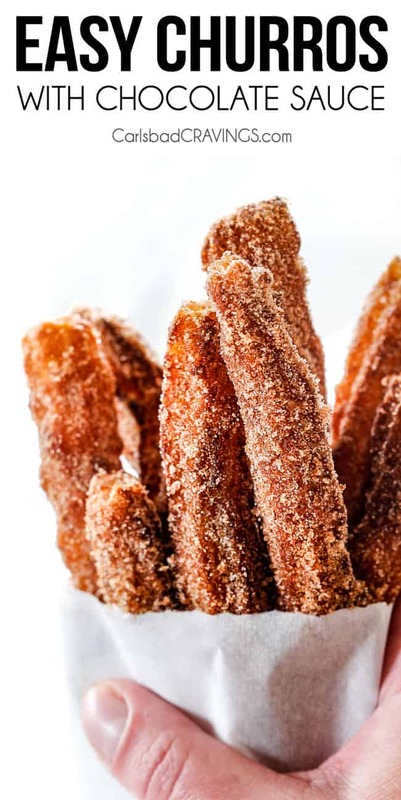 Here is a converter: http://dish.allrecipes.com/cup-to-gram-conversions/ enjoy! Great recipe! I love the caramel icing! One question though, at what point in the recipe do you use the light corn syrup? It calls for it in the ganache ingredients, but was not listed in the directions. I went without the corn syrup and the ganache turned out fine. Just wondering for future reference! Thank you! So happy you liked it Melissa! Thanks for catching that about the corn syrup – just corrected – it should be microwaved with the butter and heavy cream. It helps keep the ganache extra silky. I’m going to bake this cake for a birthday party for my girlfriend. Can it be made into three layers or can I use 8 or 9” round pans instead of 10” successfully for a two layer? Hi Susie! 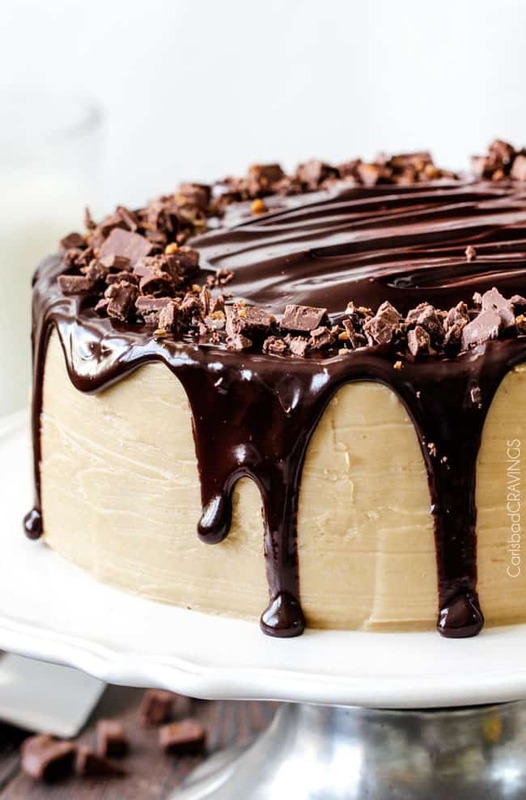 You can certainly make into a 3 layer cake using 8″ pans but just be aware that the layers will be shorter and you will have to adjust the cooking time. You an also use 2 9″ pans, but again adjust the cooking time. Enjoy!